How to apply /How to Submit Online application form on mjpabcwreis.cgg.gov.in for MJP TS BC Welfare 6th,7th,8th Classes Admission Test/ Entrance test 2019, How to Submit MJPtbcwreis CET Online application on mjpabcwreis.cgg.gov.in 2019, Telangana BC Welfare CET 2019/Mahatma Jyothiba Phule TS BC Welfare CET 2019, Online fee payment,Online application submission procedure. 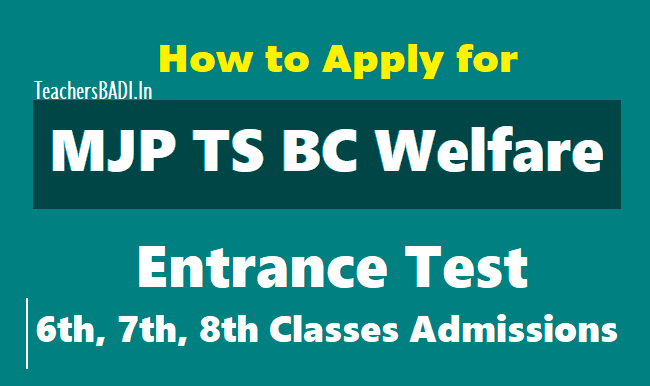 How to fill Telangana BCWREIS CET Online Application Form, How to apply for TS BC Gurukul CET, Step by step online applying procedure for 6th, 7th class Common Entrance Test for admission in Telangana BC Gurukulams. Telangang Govenrment has published the TS BC Gurukul CET 2019 (TS BC Welfare 6th, 7th Class Entrance Test) notification for admission into 6th class, 7th Class, 8th class for the academic year 2019-2020 in MJPTBCWREIS Schools. TS BC Gurukul CET officials invite the online applications from the eligible and interested students for appearing 6th Class, 7th Class 8th class Common Entrance Test for admission in TS BC Gurukulams for 2019-2020. Online Fee payment and application submission procedure details given here. Candidate seeking admission into 6th 7th and 8th classes at MJPTBC Residential Schools for the academic year 2019-19 shall apply for entrance test through online by visiting mjptbcwreis.cgg.gov.in 30 Districts of Telangana State students are eligible for admission. Date of Entrance Examination: 30-04-2019. Fee Payment Service and Submission of application is provided on TS BC Gurukul CET Website http://mjpabcwreis.cgg.gov.in/ for Common Entrance Test for Admission into 6th Class,7th, 8th class for the academic year 2019-2020. Mode of fee payment: Telangana BC Gurukul CET- 2019 Applications should be submitted through online mode only. The Registration fee for online submission must be paid through payment gateway (Credit card/Debit card/ Net Banking). After getting Unique Registration Number(URN), candidate is requested to submit the application and the candidate is required to download the application, hall ticket and take the printout. 1. The candidate shall first go through the information bulletin carefully and satisfy their eligibility for appearing for MJPTBCWR CET-2019/ 6th, 7th class TS BC Gurukul CET 2019. 2. The candidate after satisfying himself about the eligibility criteria for the submission of application through online shall pay a fee of Rs. 50/- through PAYMENT GATEWAY for submission of application through online. 3. At the PAYMENT GATEWAY centre, the candidate has to give the required preliminary data (i.e. Name of the candidate, Date of Birth and Mobile No.) • On receipt of fee at PAYMENT GATEWAY, the candidate shall be issued a journal number with which he can proceed with submission of application through online through the website mjptbcwreis.cgg.gov.in Issue of Journal number does not mean that the candidate has completed submission of application online. It is only a confirmation of the fee received. 4. Before submission of the online application form, the candidate has to upload the photo. 5. The candidates shall follow the procedure for submission of online application as given in the 'Information Bulletin' and also as per the instructions provided online while filling up the online application form. The candidate should be ready with photograph of size 3.5 x 4.5 cms before filling online application. The photo should be scanned and uploaded along with the application form. 6. While filling the online application, the candidate has to opt the course. 7. On submission of application online, the candidate has to take a copy (print) of application form in which a reference number also be given. This reference number is required to download the Hall Ticket. The copy of online application is to be preserved for further reference. 8. For any mistakes/incorrect information, the candidate is solely held responsible. Hence they must take utmost care while filling the online application. 9. The applications of the ineligible candidates will be rejected. 10. The selected candidate should be able to produce the original certificates at the time of admission as a proof to the information furnished in the application. 11. The selection of the candidate will be summarily rejected if they fail to submit the necessary documents at the time of admission. 2. The Principal of the school concerned reserves the right to cancel the admission at any stage, if the particulars furnished by the candidate are found incorrect or against the rules of admission. 4. The information furnished in the application by the candidate will only be considered and registered and if any candidate fails to fill the information completely or given wrong information, the fault lies with the candidate only. Step I: Pay the fee through Fee payment service of TS BC Gurkul CET Portal. After completion of Fee payment, candidate should receive the Journal Number. Step IV: Review your Submitted data. If you want changes, you can change in this step. Step V: Now Submit the application form and take a print with your Hall ticket and preserve it.